He said this at the unveiling Repliee Q1, a female android, said to be “the most human-looking robot yet devised”. He added an android could get away with it for a short time, 5-10 seconds. “However, if we carefully select the situation, we could extend that, to perhaps 10 minutes,” he said. 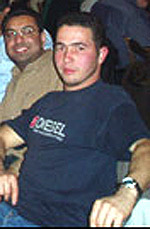 The man shot dead in Stockwell Tube, London, turned out to be an innocent Brazilian electrician. Jean Charles de Menezes, 27, (pic left) had the misfortune of wearing a thick coat in summer that make police jump to conclusions. Witness Mark Whitby told BBC News 24: “I was sitting on the train… I heard a load of noise, people saying, ‘Get out, get down’. “I saw an Asian guy. He ran on to the train, he was hotly pursued by three plain clothes officers, one of them was wielding a black handgun. “He half tripped… they pushed him to the floor and basically unloaded five shots into him,” he said. “As [the suspect] got onto the train I looked at his face, he looked sort of left and right, but he basically looked like a cornered rabbit, a cornered fox. “He looked absolutely petrified and then he sort of tripped, but they were hotly pursuing him, [they] couldn’t have been any more than two or three feet behind him at this time and he half tripped and was half pushed to the floor and the policeman nearest to me had the black automatic pistol in his left hand. “He held it down to the guy and unloaded five shots into him. “He [the suspect] had a baseball cap on and quite a sort of thickish coat – it was a coat you’d wear in winter, sort of like a padded jacket. “He might have had something concealed under there, I don’t know. But it looked sort of out of place with the sort of weather we’ve been having, the sort of hot humid weather. “He was largely built, he was quite a chubby sort of guy. The Brazilian government has expressed its shock at the killing and Brazil’s foreign minister Celso Amorim is on his way to London to get an explanation from foreign secretary Jack Straw. UPDATE: Aug 16, 2005, …The (secret) documents and photographs confirm that Jean Charles was not carrying any bags, and was wearing a denim jacket, not a bulky winter coat, as had previously been claimed. …post mortem examination showed Mr de Menezes was shot seven times in the head and once in the shoulder, but three other bullets missed, with the casings left lying in the tube carriage. Police have declined to comment while the mistaken killing is still being investigated. MORE. It’s starting to look like Netscape days again. Google’s shares hit US$309 last I looked. Compare this to Amazon at $38, Yahoo at $37, eBay at $35, IBM at $83, Dell at $41, HP at $24. This means the shares have trebled in value since the company’s initial public offering in mid-August 2004. Why is Morgan Freeman trying to kickstart the online distribution of movies? Can anyone say Whoopi Goldberg and Flooz.com already? He added that the distribution windows are no longer meaningful because of online piracy and bootleg DVDs. “DVDs are already available in China and in Russia even before they are released for sale here,” Mr. Freeman said. 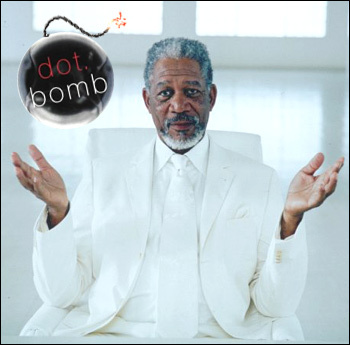 Morgan Freeman maybe a great actor, and I respect him for that, but he’s walking into this with blinkers on. Or perhaps Intel has lured him with more money than he can possibly make in his next movie. With BitTorrent and broadband, any attempt to sell movies online will just die a premature death. Freeman plans Internet releases coinciding with theater dates thereby attempting to kill the very weekend opener that the industry thrives on. Movies are distributed in orchestrated progressions from theatres to DVD to cable to TV broadcast. What studio is going to give up those repeat sales in the near future? Mr Freeman, this may be your Million Dollar Dud. The fact that the exercise mirrored the exact locations and times of the bombings is light years beyond a coincidence. Power said the drill focused around ’simultaneous bombings’. At first the bombings were thought to have been spread over an hour, but the BBC reports just today that the bombings were in fact simultaneous. Graphic designer Dario Agosta created a series of T-shirts based on the London Underground sign. Proceeds will go to Red Cross relief fund. 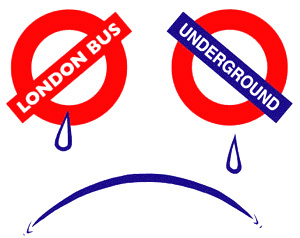 He writes: “To me, London tube is a major symbol of London, and its identity is a major symbol of what good graphic design should be. 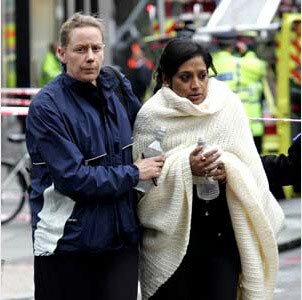 “My sympathies go to those who were affected. 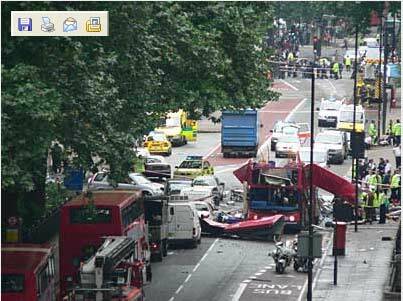 On the morning of July, 7 I was emailing a press representative for a page-ad on a magazine, and turned out her office is a few blocks from the Regent St. Tube Station, and as I was writing, the bombings were taking place. As soon as I read the news, I was chilled. “Why am I writing this ? because none of us can really feel he or she is far and safe and sound from what happened in London yesterday, or from what happened in Madrid last year, or from what happened in New York in 2001, or from what happened and still is happening in occupied countries. None. Of. Us. “But, what can I really do (apart from quitting writing such drivel ?). Good point, gosh. I am a designer, I design bloody things. 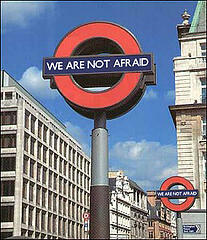 A site called “WE’RENOTAFRAID.COM” has reactionary graphical postings (right) from blogosphere. 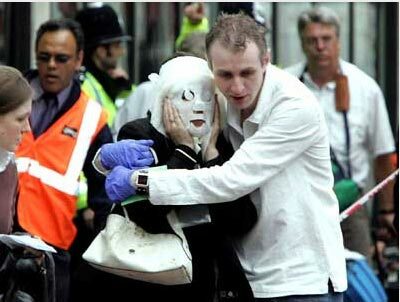 Cameraphone video footage and pics came to the fore after London’s tragic bombings. 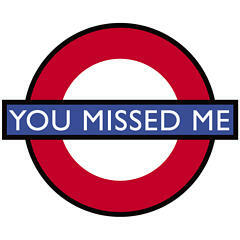 mtippett posted a screencap of the Most Viewed Image on Yahoo News was that of a smoky, carriage in a London tube. Although it was grainy and greenish, the image indicates the speed of citizen news reporting to come when everyone has a cameraphone. 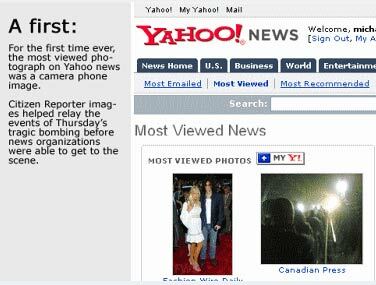 It was, possibly, the first widespread use of that technology in covering a major breaking news story of global significance. Of the 192 million cellphones in the U.S., about 18%, or roughly 34.5 million, now have cameras. The percentage of camera phones is even higher in Europe, where the technology has been around longer. Loaded with features including text messaging, video games, cameras, live TV and the ability to record and transmit video through the Internet, the phones have become must-have items, especially among teens. They’ve been banned as voyeuristic irritants — or worse — at venues ranging from schools to Hollywood movie screenings. But, as they proved in London on Thursday, they can also provide a ground-level view of history. “You forget how many people have these phones now and how much more of the first minutes of an event you’re going to see,” said Chuck Lustig, director of foreign news coverage for ABC. British television network ITN received dozens of video clips, some by e-mail and others from survivors of the blasts who brought their phones directly to the London newsroom. 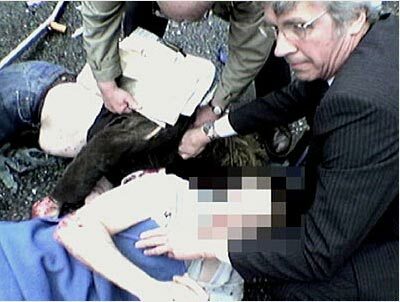 Some of the video clips were too gruesome too air, according to one senior editor. Sky News aired a haunting 20-second clip filmed by a commuter on a train between the King’s Cross and Russell Square stations, who e-mailed it to the British television network, Fox News’ sister channel. It showed lines of people filing through dark tunnels under greenish lights and an alarmed man staring at the camera, part of his face obscured by a cloth over his mouth. BBC aired video from cellphones throughout the day, as well. The British channels distributed the footage to other networks, including those in the United States. The amateur video clips quickly became a staple of the news coverage. The video did not provide the usual crisp images sought by news producers. Shakily filmed, the footage showed frightened Londoners cast in an eerie green light, holding handkerchiefs over their mouths to block the smoke as they struggled to get out of the subway. In fact, the footage might not have garnered much attention if there had been extensive professional video of the explosions’ aftermath. But on a day devoted to nonstop coverage of the bombings, news executives said the mobile phone video was able to convey the claustrophobic atmosphere underground. “It was a little bit murky and blurry, but the viewer could get a sense that something bad had happened,” said Marcy McGinnis, senior vice president for news coverage at CBS. “It’s a harbinger of what’s to come in terms of citizen journalism,” said Jon Klein, president of CNN/U.S. “These days, you just have to be in the wrong place at the right time, and you too can cover the news…..Neil Strother, a Seattle-based analyst who tracks the use of mobile devices for the research firm In-Stat, said the number of U.S. cellphones with camera or video capability was expected to grow significantly in the next year as developing technology allowed for higher-quality images and wireless carriers expanded their broadband networks. I remember reading an Online Journalism Review article about the aftermath of a 12-vehicle pile-up that happened on June 23, 2003 in Japan and was captured by a trucker. The video of the accident that occurred on the Tomei Expressway in Aichi Prefecture, in which four people died, was later shown on NHK, Japan’s public broadcasting station. Welcome to 21st century journalism! I tried Google Earth and flipped. Wow, an amazing piece of software — and for free at that — where you can virtually fly over buildings, or across the Earth to specific addresses. 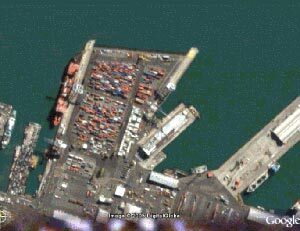 Could actually “see” the stacks of containers on the wharves I used to walk past in Auckland in New Zealand. Google says some of the pics are three years old but the details – especially for some destinations in the US – were amazing. I guess the terrorists are so dumb, they can’t figure this out (duh). Meanwhile, Chris Pirillo shows us a sneak peek of MSN Virtual Earth in wmv format. It looks equally amazing, though it won’t be out for some time yet. All pics above from Skynews. LONDON – Three explosions rocked the London subway and one tore open a packed double-decker bus during the morning rush hour Thursday. 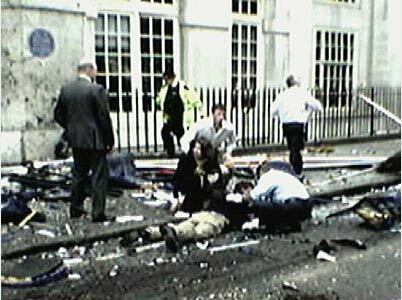 The blasts killed at least two people and injured about 190 in what a shaken Prime Minister Tony Blair called a series of “barbaric” terrorist attacks.